The GX2200 Matrix AIS/GPS VHF in Black from Standard Horizon combines the best in a VHF Radio and AIS receiver with an internal 66 Channel GPS antenna. Save time and the hassle of interfacing devices, the GX2200 requires just a VHF antenna and power to get going. The onscreen AIS target display shows other ships and helps keep you safe on the water. Order Now Through July 31st, 2019 and get a $30 Mail-In Rebate From Standard Horizon! 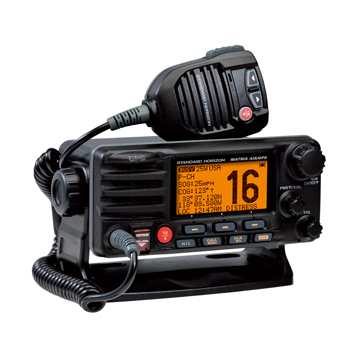 This 25 Watt full featured VHF radio has a dual channel AIS receiver built-in as well as a 66 Channel GPS receiver. Because there is a built in GPS you don’t have to connect the GX 2200 to a chartplotter or GPS antenna to receive AIS or DSC information. The Oversized Display shows AIS target information including call sign, ship name, bearing, distance and more. You can also share the AIS information to your chartplotter with a NMEA 0183 connection. 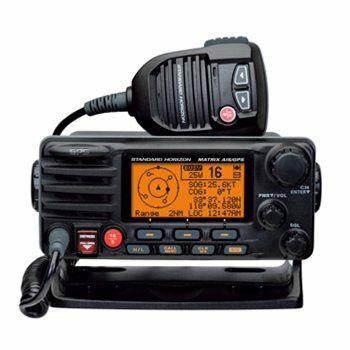 Need to remotely control the VHF from your cockpit or fly bridge? The Matrix AIS is RAM3 remote mic capable to control all VHF, DSC functions at a second station. The Standard Horizon Matrix AIS/GPS VHF Radio is exceptional in both design in performance and safety. The Matrix AIS also has class D DSC and distress functions which can transmit a MAYDAY signal including vessel identification lat/ lon and time in case of emergency. The built-in loud hailer also has 30 watts of power with both fog signalling and listen back. The internal GPS can also be used as a navigation tool to know your location and save waypoints, up to 100. The Matrix AIS GX2200 is waterproof and has a big, bright LCD display, large channel tuning knob, channel changing microphone, programmable scan, all US and International channels, 10 NOAA weather channels and weather alert. It's also backed with a 3 year warranty. Built-in Dual Channel AIS Receiver. Internal 66 Channel GPS Antenna. DSC and Loud Hailer Functions. Standard Horizon CMP31 RAM3+ Microphone features a louder speaker and 75% longer mic cable than the previous model, now 24". Included in the box is a 23' routing cable, rubber cap, mounting bracket, microphone hanger, and ferrite core. Standard Horizon 240SW 5" x 7" PA Horn. 4 Ohm and 30W output. Shakespeare 5104 Centennial 4 Foot VHF Antenna, 3db performance with a high-gloss finish. Standard Horizon 23' Extension for RAM Mic. Shakespeare Shim Kit for 4186 & 4187 Rachet Mount. Kit includes Four (4) Shims, two (2) with front/back slope and two (2) with side/side slope. Each shim adds a half-notch (5°) tilt. The Shakespeare 5215 is a Sailboater's favorite thanks to its stainless steel construction and lightweight, low profile design. Standard Horizon Matrix GX2000 VHF Radio with built-in Loud Hailer, DSC and waterproof construction. Color: Black. The GX2200 Matrix AIS/GPS VHF in White from Standard Horizon combines the best in a VHF Radio and AIS receiver with an internal 66 Channel GPS antenna. Save time and the hassle of interfacing devices, the GX2200 requires just a VHF antenna and power to get going. The onscreen AIS target display shows other ships and helps keep you safe on the water. The GX6000 from Standard Horizon offers a 25W Fixed Mount VHF with NMEA2000 and Integrated AIS Receiver. E2O - Easy to Operate Menu System and Large Rotary Channel Knob with Push to Enter. Order now through July 31st, 2019 and get a $40 Mail-In Rebate from Standard Horizon!